The size of a farm is irrelevant when it comes animal welfare, new research has found. The research, published in the Universities Federation for Animal Welfare (UFAW) journal Animal Welfare, focused specifically on whether animal welfare is compromised on larger farms and, if so, how. 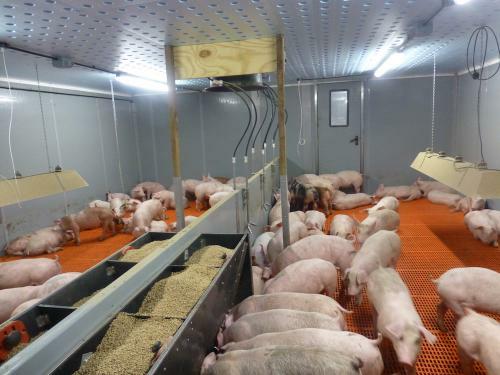 Researchers looked at the welfare level of sixty conventional fattening pig farms in Northern Germany with a range of 250 pigs to 11,000 pigs per farm. Using four basic principles – good feeding, good housing, good health and appropriate behaviour, the study revealed that none of the farm sizes proved superior in terms of animal welfare. However, none of the farms were scored as ‘excellent’. Farm size did not affect the principle of good feeding, which scored the highest of all four principles – mainly due to the fact that only a very limited number of pigs had a poor body condition. Nonetheless, the water supply was found to be insufficient on 16 of the farms and a lack of and poorly functioning drinkers were found across all the farm sizes with one farm recording a maximum number of 43 pigs per drinker, which far exceeded the threshold of 12 per drinker required in meet German legislation. Farm size did not affect the principle of good health either, although this was scored the lowest of the four principles. ‘Moderate wounds’ were the third most common indicator of poor welfare and there was also a high frequency of bursitis, wounds and manure on the pigs – indicative of the necessity for progression in the production system to improve animal welfare, the researchers said. Although the study assessed tail-biting, lameness, hernia, severe wounds, skin condition, coughing and sneezing, these were only seen at very low rates without any difference between the farm sizes. Appropriate behaviour also recorded low scores in all the farm sizes. The space allowances in more than 40% of the pens were below the German Farm Animal Welfare Regulations and over-crowded pens were found on 92% of the farms - although the proportion of over-crowed pens was lowest on large farms. The study concluded that although overall, acceptable or enhanced scores were achieved for many of the criteria, the need for improvement in others was clear. NPA senior policy advisor Georgina Crayford said: "This research highlights what we have known all along - that the size of a farm is not a factor in the welfare of the animals on it, despite the efforts of some organisations to claim otherwise. "There is lots of evidence to show large farms, indoor and and outdoor units, can deliver the very highest standards of of animal health and welfare, alongside low antibiotic use. There are many factors that contribute to welfare standards, led by the how the farm is managed and quality of stockmanship, but also including smart use of technology, ventilation, lighting, data recording, nutrition, access to veterinary care and much more - but the size of the farm is not one of them."